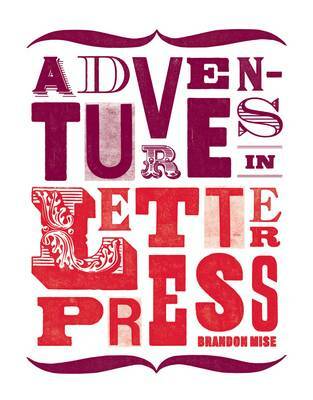 Letterpress has been undergoing a revival as a reaction to the widespread digitization of art and design, this book will appeal to both designers and crafts enthusiasts. It includes edgy, witty designs ranging from quirky political ads and poetry broadsides to humorous ephemera, animalia, retro and just plain weird stuff. It features the work of 80 unique presses from across the United States. The artists and printers featured in Adventures in Leterpress shun standard mass-produced fare, favoring the beauty and physicality of doing things the old fashioned way. Framed by interviews of the people keeping the letterpress tradition alive, the book's photographs feature the delicate details and exciting and edgy designs that make clear why there is a renewed interest in letterpress posters, cards, and packaging.